GEMS Medical College is managed by a dedicated by medical professionals of GEMS with rich teaching, clinical and research experience reputed medical colleges and hospitals in the country. The department of Pharmacology, Great Eastern Medical School and Hospital was established in the year 2010. It is a well equipped department with experienced faculty. Department located at ground floor of college. Pharmacology deals with the study of drugs and drug development Basically it says what the drug does to the body and what the body does to the drug when administered. Pharmacology was traditionally associated with study of drugs in animals while the clinical application was regarded as an entirely independent and mystical skill of the practitioner. Now with the concept of “Evidence Based Medicine” the aim of teaching Pharmacology to Medical students is to provide a rational basis for choosing and using drugs skillfully to relieve patient’s ailments based on the information obtained from the clinical trials. HOD Pharmacology supervises Pharmaco Vigilance Committee which meets regularly to review the drug policies. 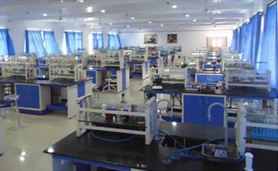 Research Lab: This department is well equipped to meet the requirement of students and carry out clinical research. Experimental Lab: Analysis of Drugs and Rabbit Eye Experiments. Pharmacy Lab: Preparing Pharmaceutical products . Museum: Well Furnished Museum having various Specimens, Photographs, Flow Charts and Specimens of Indigenous as well as modern drugs. Departmental Library: A well furnished Library with 100 Books. Seminar and Demonstration rooms, Lecture Theaters with Audiovisual aids. To monitor the ongoing Research Projects. One hour extra class for slow learners. Curriculum planning is prepared (as per the MCI and NTR UHS recommendations and Curriculum Committee recommended Value added syllabus)and followed in the same method. All the specimens are tagged with legends and numbered sequentially. Catalogues are available showing the Index number of each specimen. All methods of teaching such as didactic lectures, interactive method, and project based learning, computer assisted learning, and experimental learning, seminars and dissertations are used by the teachers. ICT based teaching is given a thrust as a principal mode of teaching. Every attempt is made to attend individual students and find out their strength and weakness. In the Department planning the students are divided into groups basing on their common requirements. This division is not visible to the students as the Practical and tutorial groups are always divided as per the roll numbers. The teaching faculties design plans to touch the needy students during the learning sessions. It is meticulously planned prior to each session so that there will not be any feeling of inferiority among themselves. However depending on the Internal assessment performances (One of the Summative examination) a modified method of revision of topics are done for the students securing less(than average) marks. Both formative and Summative evaluation is done through conducting Examinations .Both subjective and objective type of questions is used. Most advanced methods are used in designing the question paper as a feasible, acceptable, valid, reliable, objective, unambiguous and bias free. Before announcing the results of each examinationa Grievance redressal session is being held, giving a chance to each student to appeal on evaluation process if any. Out of total 300 students trained so far only 39 students are left so far to clear the Summative examination conducted by Dr NTR UHS. The pass percentage is 87. HOD is one of the members of Institution label medical education unit. Comparison of Age of eruption of teeth in school children of Khammam in TS and Srikakulam in AP. A study on ratio between organ weight and body weight in dead bodies of human being. Conducting regular Medico legal workshops for Doctors, Lawyers and Police in Srikakulam Dist. Organizing State and National Conferences. Under taking research in various Medico legal fields with involvement of students. The department of Pathology, Great Eastern Medical School and Hospital was established in the year 2010. It is a well equipped department with experienced faculty. Department located at ground floor of college. 1. To cater to the diagnostic needs of patients attending Great Eastern Medical School and Hospital. 2. Teaching to undergraduates, Para Medical staff..
laboratory in hospital and also in the College premisis. Has 232 specimens each have it 10 cat logs. Charts 65. Scientist photographs 14.
c) Study of biopsies starting from true cut to excision biopsies. b) Urine analysis including microscopic exam. c) Study of blood and urine parasites. 5. AUTOPSIES: BUILDING IS AVAIALBUL FOR AUTOPSIES. 1. Dr. Pramod Jayasing Rao Shinde, Professor & HOD. The department of Microbiology, Great Eastern Medical School and Hospital was established in the year 2010. It is a well equipped department with experienced faculty. Department located at first floor of college. 2. Under graduate teaching and Paramedical teaching. Facilities: The department has various diagnostic sections which are located in central laboratory in hospital and also in the department. Museum: Has 200 exhibits which include charts, models and specimens. In the past one year the department has published 4 papers. Designated Microscopy Center (DMC) has also allotted recently under Revised National Tuberculosis Control Progreem (RNTCP). Community Medicine encompasses a wide range and broad spectrum of activities for prevention of disease and promoting health of general population by virtue of its multifarious measures for communities, masses and individuals. It covers wider practical approach of Public Health, besides regular teaching and training activities for undergraduate & postgraduate Medical College students, as well as Interns. The Department also caters to the essential health needs of population located under the field practice area of Rural Health Training Centre, Singupuram as well as that under Urban Heath Training Centre, Amdalavalasa. The Department of Community Medicine is located on the second floor in the Great Eastern Medical School and Hospital, Medical College building at Ragolu, Srikakulam. It provides quality medical education and health services through RHTC and UHTC with the help of adequate teaching and non-teaching staff. It is well equipped with a museum, departmental library, demonstration rooms, research laboratory and audio-visual teaching aids. The Department owns 2 vehicles and 1 ambulance for ferrying students and patients from field practice area and organization of various surveys and health camps. Includes topics as per NTRUHS/MCI guidelines, such as Environmental Health, Biostatistics, Epidemiology, Communicable & Non-communicable disease, Community Health and Health administration. Up to date library having books, reference books, journals & educative material. Research laboratory for Undergraduate & Postgraduate teaching & training, for research work as well. Family & School Health Survey. Special activities for students like seminars, Public Health Quizzes, other academic events/competitions. Research Projects/activities related to Public Health & Preventive & Social Medicine are undertaken by Community Medicine Department regularly by the faculty, UG students & Interns. Active participation in Research Society activities of the Institution. Statistical guidance & help to research activities of the College PG Students. Participation in National Health programmes like RNTCP, NACP, NRHM. Event management of the Institution.